Have you recently remodeled your kitchen or are you experiencing issues with your electrical system? Or, are you considering investigating if your electrical system can run even more efficiently. Whatever electrical repair, or installation need you may have, the local electricians of Front Range Electric in Colorado Springs are here to help you have an electrical system that will run well, sustain your electrical needs, and keep you and your family safe. Are you ready for a change in your current home or have you just moved into a home that needs some extra love? Perhaps a remodel is just what you need! Our electricians can help you with large-scale remodels, as well as bathroom and kitchen remodels. For any remodel project, you will likely need to alter your electrical system; when you make changes in your kitchen, due to not only your electrical needs in these rooms usually exceeding the other rooms in your home, but also due to possible safety hazards, it is important that your electrical system is up to building code and suited for new appliances, light fixtures, and other additions. Many older homes in the Colorado Springs area that have original electrical wiring are simply not suited for today’s electrical needs. The electricians of Front Range Electric can assess your needs and install what you need to make your dream bathroom remodel or your kitchen remodel come true. Remodeling a home can be an exciting, yet stressful endeavor. The electricians at Front Range Electric would love to help you make your dream home in the Colorado Springs are a reality. We can help you replace old and corroded wiring that is found in older homes and make sure that your home has an electrical system that will support the lifestyle that you want. Newer appliances such as HVAC systems, washers and dryers, fridges and others require more power than some older home’s wiring systems can provide; with greater use of personal electronics and systems, you will definitely have to consider upgrading your electrical system. Whether you are living in an older home that needs updating or a modern home that you simply want to upgrade, the electricians of Front Range Electric can help you with a variety of remodeling needs. For more specific information about what what we offer to our Colorado Springs clients, contact us for a free consultation! When you are remodeling or moving into a new home, you must have all electrical work up to building code standards. Building code is in place to guarantee building best practices and to reduce safety hazards. 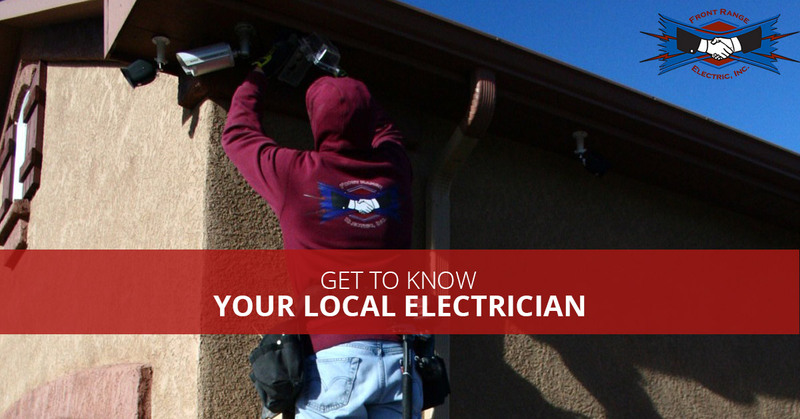 Our electricians can help you assess if your home or remodel meets building codes and help you with the possible changes that you may need to make. Wanting to install a new lighting fixture or ceiling fan in your Colorado Springs home? Front Range Electric can help! Our electricians can install your new light fixture or ceiling fan securely and with the needed electrical wiring and setup. We are used to standing on ladders and knowing how to install a light fixture or ceiling fan well and in such a way that will not damage the surrounding ceiling area. As with all that we do, our electricians work with high standards in mind to not only perform the job well, but to give you the home that you’ve always dreamed of, all while ensuring your family’s safety and giving you the highest level of customer service. We strive to exceed your expectations. Did you just get a hot tub or does your current hot tub need some work? Our electricians can help you make sure your hot tub is connected right so you can fully enjoy relaxing in your hot tub. Your hot tub needs to have proper power to function: Hooking up your hot tub means having the correct wiring, conduit, and hardware in place. Is your hot tub acting up or older? Our electricians can troubleshoot problems you may be having and may be able to prevent future issues. It’s that time of year, when we are beginning to see warmer weather and are starting to pull out camping gear and swimming suits. Before the weather gets too hot, be sure that your air conditioning unit is functioning at it’s best. Don’t be left out in the heat with an air conditioner that isn’t running well or already broken. Often if your air conditioner seems to be acting up, the issue can be fixed with simple rewiring. The electricians at Front Range Electric can help you stay cool in Colorado Springs all summer long! Do you have a dead switch or an outlet that has never worked? Does your electrical system seem to be at it’s maximum and you constantly have to visit the breaker box to get your system working again? Our local electricians are here to help! We can help you figure out the problem and fix it no matter how big or small the fix or issue is. Call Front Range Electric for a free consultation! Our electricians would love to help you have an electrical system that is fully functional and supports your lifestyle. Front Range Electric’s electricians can help you with these and other electrical issues and needs that you may have! We offer experience, backed by professionalism, official certification and training, as well as an adherence to high standards of quality and customer services. Our electricians have decades of experience to offer our clients in the Colorado Springs area and look forward to helping you. If you don’t see the service you need listed or have any questions, please contact us! We’d love to help you! We also offer free consultations!